Situated on Jones Bay Wharf in Pyrmont and surrounded by luxury apartments and million dollar boats, this inconspicuous yet beautifully situated cafe showed promise the instant we seated ourselves on the stools in the sun and were greeted immediately by the staff. The morning crowd is somewhat subdued. 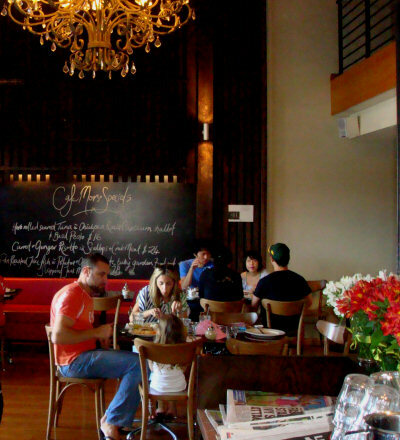 Even during busy periods the openness of the cafe would result in a relaxed experience. Guests have a choice of sitting inside or outside, with a further 3 tables and accompanying stools beyond the outdoor seating. The blueberry, pineapple & mint frappe ($6) was… minty and watery. Try as we might, there wasn’t much other flavour unfortunately. Expectations remained high though as we had heard great things about the Orange pancakes with yoghurt, mixed berry compote and maple syrup ($13). 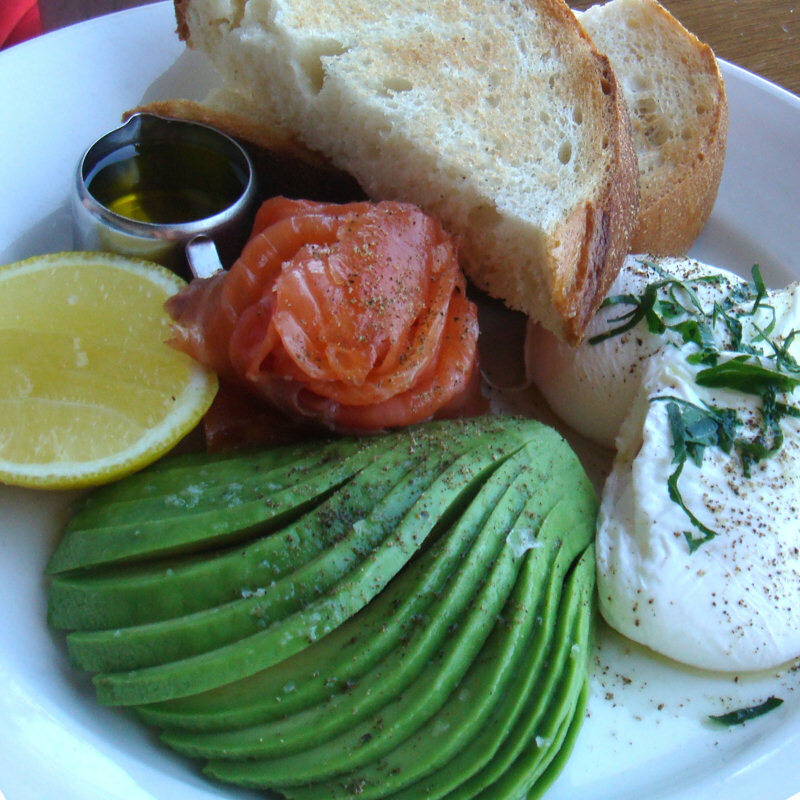 In addition to this we ordered the Avocado and house cured salmon, lemon, extra virgin olive oil and toast with the option of two poached free range eggs ($18). 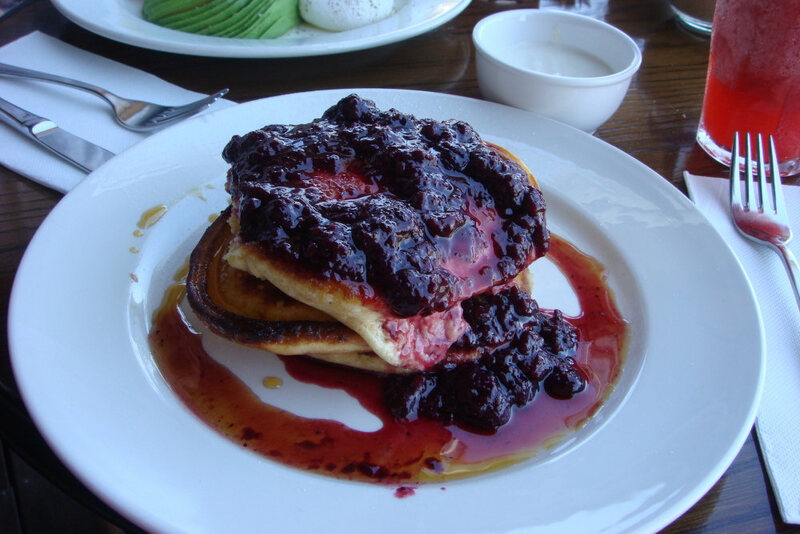 The stack of pancakes was a sight to behold topped with the compote and surrounded on the plate with the syrup and more blueberries. Soft, incredibly light and the sweetness matched perfectly by the yoghurt which we ordered on the side, this dish was the highlight of the morning (let alone the day!). The avocado and salmon featured a plate of ingredients that complemented each other to a tee. The cured salmon was cut thicker than normal which gave the slices great texture. The toast crust was thankfully not too hard, the poached eggs oozed a bright yellow and were fantastic. The cafe is pet friendly… pets are welcome to sit with their owners at the 3 tables a few feet away from the main section of outside tables. Waitstaff even tend to the pets with a bowl of fresh water! 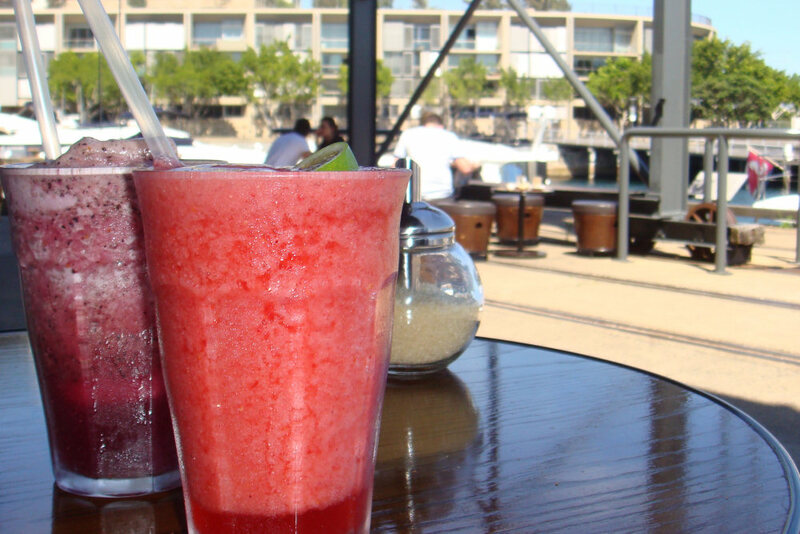 This entry was posted in Sydney - CBD and tagged Dog friendly, Outdoor seating, Water views. Bookmark the permalink. Thanks for the link – the pics look wonderful. I hope to use this blog a reference for my inevitable trip to Sydney one day!